Rexel's range of shredders allow you to get rid of your unwanted documents both safely & securely. A huge selection is available for both personal or business use. Rexel's Range of Auto+ Cross Cut shredders save time by 98% when compared to traditional shredding, simply stack, shut and go! Available from 60 up to 750 sheets you are sure to find a model to suit your needs and budget. Auto Feed Shredding is now possible even for higher security requirements. Simply stack, shut and go and your documents will be shredded into tiny Din Level P-4 micro cut pieces keeping your private company information safe. Paper jams are history thanks to Rexel's Mercury Technology. When too much paper is offered the shredder will display a red light and won't shred it leaving you more time to get on with your work and less time spent at the shredder. Rexel's range of specialist Wide Entry machines allows bulk destruction of A4, A3 and computer listing paper. These machines have a jam free function and are available in a variety of security levels right up to Din Level P-7. Rexel have a large choice of Executive Desk-Side models designed for a single person to use in addition to a larger shared machine in an open plan office or in smaller offices/at home as a reliable and visually appealing machine. 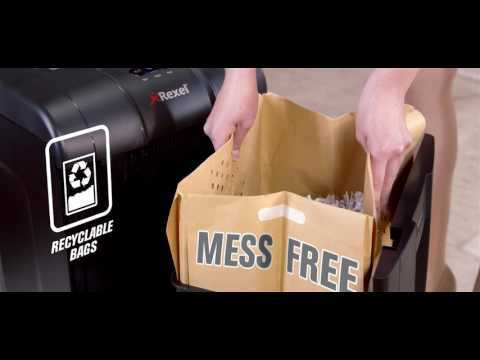 Rexel have a huge range of Recyclable shredder waste sacks for many of their machines making them excellent for the environment as well as a range of sturdy plastic sacks. Once a day Oil Sheets or traditional Shredder Oil are also available. We have a huge catalogue of Rexel Shredder videos that can be found on the relevant product detail pages just below the product image.